Bring your friends, family or colleagues together for a Liverpool murder mystery dinner you’ll never forget. A murder mystery offers a unique and fun way to bring groups of people together for an event to remember. If you’re planning the next big work night out, a milestone birthday party or a hen do, a murder mystery game will get everyone excited, involved and talking about it for months to come. Our murder mystery Liverpool parties invite you to take a full part in the game by taking on your very own character role. We don’t use actors, so you could be a suspect, a witness, or a detective, and one of you has committed a deadly crime. The comedy and humour in our exclusive in-house scripts can only be rivalled by our vivacious event hosts, who join you in Liverpool to take you through every activity, quiz and game. We know that the style of your party is crucial. That’s why our murder mystery themes are fresh and modern, with a range to suit every taste. Whether you can’t get enough of the roaring 1920s or you love the 1950s, we have a perfect murder mystery for you. We only source the most unique and tasteful restaurants in Liverpool, so you can rely on us to make the party planning process hassle free. Our event management team is here to help you from enquiry to party night. All you need to do if tell us the occasion and we’ll do the rest. "I would just like to congratulate your whole team on a very, very enjoyable hen party murder mystery on Saturday." 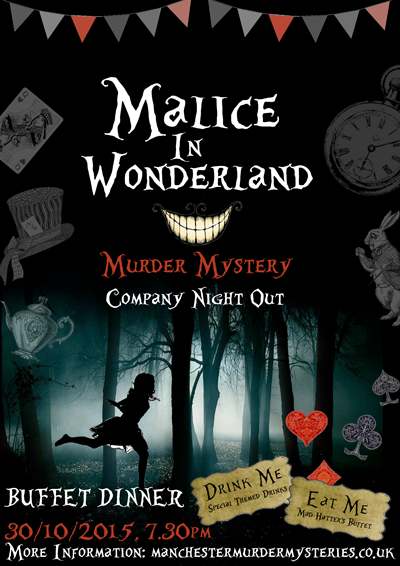 …our ‘Malice in Wonderland‘ theme for your party! This dark and funny take on the classic tales by Lewis Carroll will see you delve into a world of magic, mystery and utter nonsense.